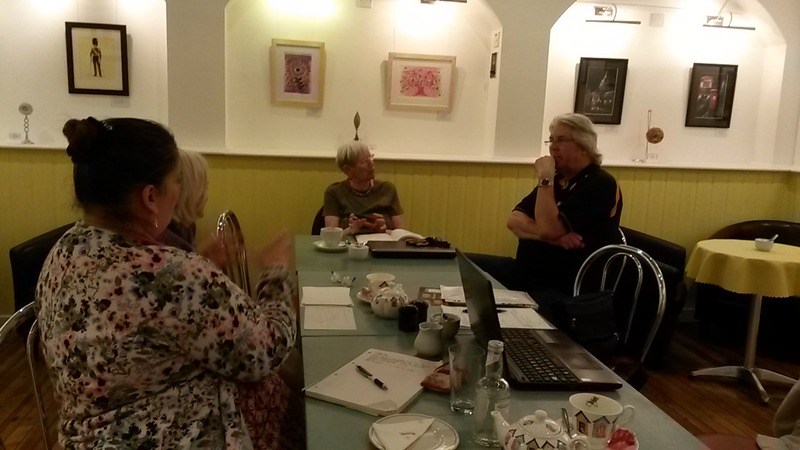 Last November I led a set of writing workshops and had the fabulous authors/tutors: Glynis Smy, Ann Bowyer, Rosy Thornton, Jayne-Marie Barker and Jo Wilde run some sessions. 6 of the writers set themselves a challenge to write and self-publish before July 10th. I decided to join them in this challenge. 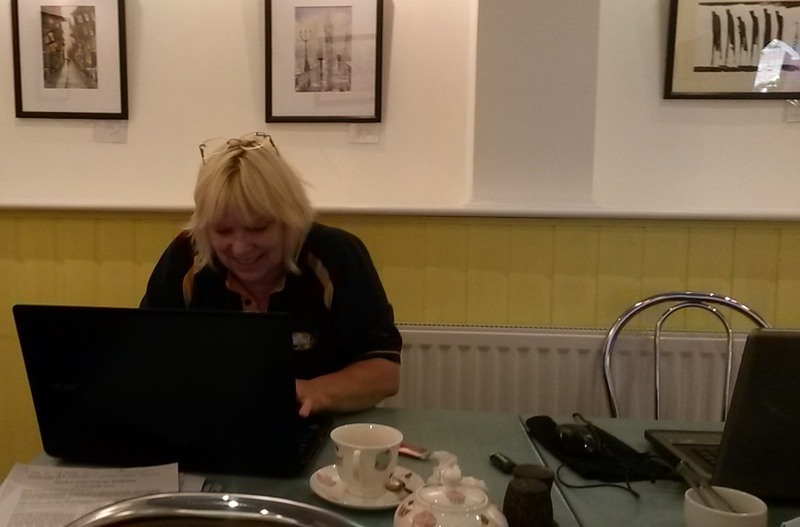 We decided on the name Waveney Author Group (WAG) as we all live within the Waveney area. 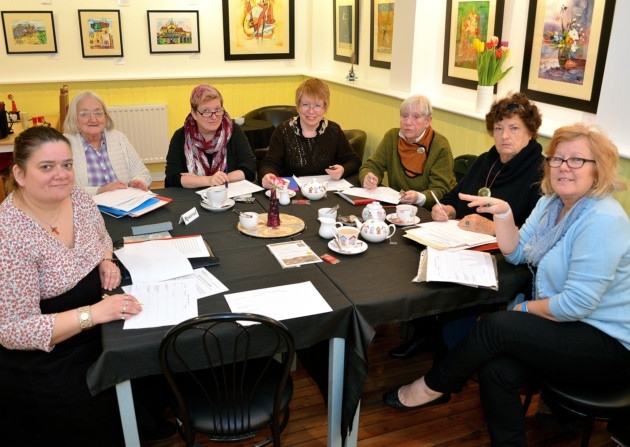 Our first meeting was at The Coconut Loft Art Gallery and we were grateful for the support of The Journal newspaper who came to do an article on us and took this picture. The Coconut Loft Art Gallery became our place to meet. Firstly on a monthly basis and now we meet on a weekly basis to enable the writers to achieve their goal. 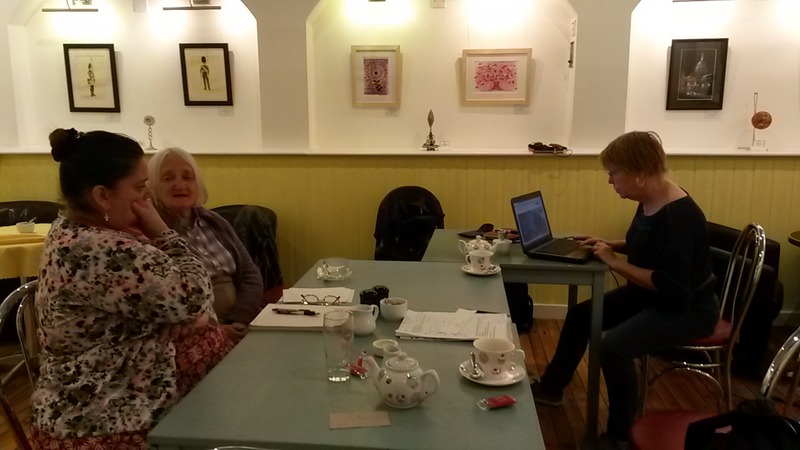 The Coconut Loft Art Gallery is a great place to write, an inspiring place that not only sells lovely food but also Richard and Gina, the owners, are always willing to help, whether it be to help one of the writer’s sort her blurb out or help another writer sort her page layout. The owners Gina and Richard watching new author Pam Finch press the button and upload her work to Create Space (and within a short space of time her book, Minho Moments, was on Amazon). Gina helping a writer with her formatting. 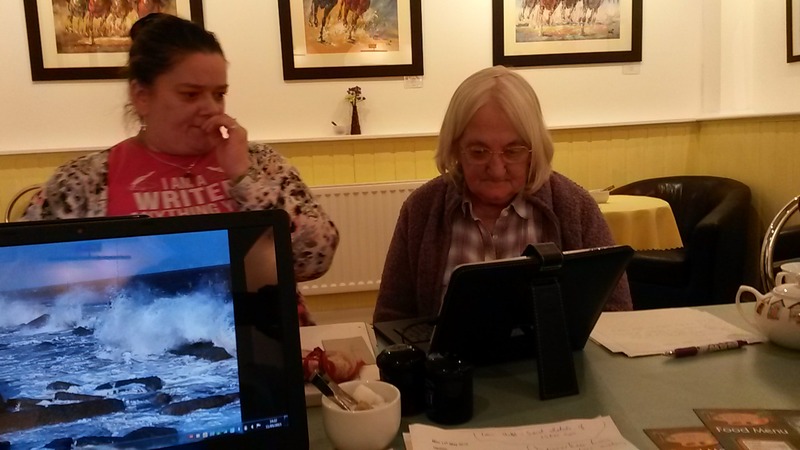 Helen Thwaites helping her mum with her tablet. Enid and Helen Thwaites and Helen Meneghello. 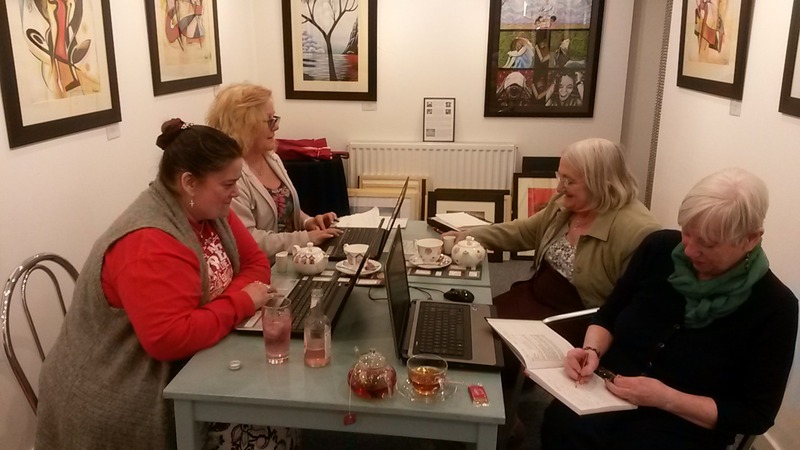 Helen Thwaites, Me (Suzan Collins), Enid Thwaites and Pam Finch writing in The Smugglers’ Gallery. 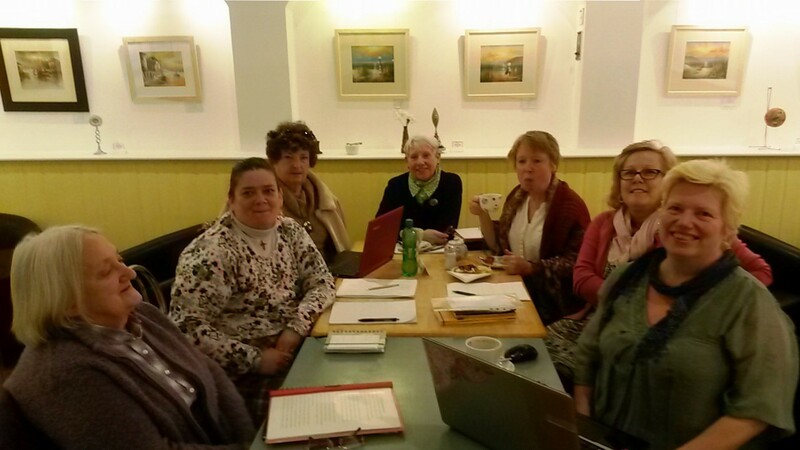 Enid Thwaites, Helen Thwaites, Bronwen Grono, Pam Finch, Helen Meneghello, Me (Suzan Collins) and Jo Wilde. Venue: Already established for its two vibrant galleries of colourful, original paintings, the Coconut Loft Art Gallery, 8 Waterloo Rd, Lowestoft, Suffolk NR33 0AA, is the perfect venue to showcase your books. As well as allowing you to show off your work, the Coconut Loft Art Gallery also sells sensational Italian coffee, ice cream and great value lunches, adding to its established footfall.